Over the next ten years, the biological safety conferences grew to include representatives from all federal agencies that sponsored or conducted research with pathogenic microorganisms. By 1966 it began to include representatives from universities, private laboratories, hospitals, and industrial complexes. Throughout the 1970s, participation in the conferences continued to expand and by 1983 discussions began regarding the creation of a formal organization. The American Biological Safety Association (ABSA) was officially established in 1984 and a constitution and bylaws were drafted the same year. As of 2008, ABSA includes some 1,600 members in its professional association. 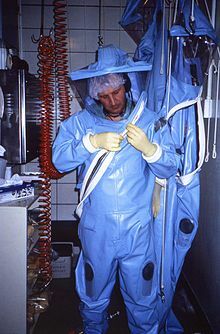 CDC technician dons an older-model positive-pressure suit before entering one of the CDC’s earlier maximum containment labs. Biosafety level 1 (BSL-1) is suitable for work with well-characterized agents which do not cause disease in healthy humans. In general, these agents should pose minimal potential hazard to laboratory personnel and the environment. At this level, precautions are limited relative to other levels. Laboratory personnel must wash their hands upon entering and exiting the lab. Research with these agents may be performed on standard open laboratory benches without the use of special containment equipment. However, eating and drinking are generally prohibited in laboratory areas. Potentially infectious material must be decontaminated before disposal, either by adding an appropriate disinfectant, or by packaging for decontamination elsewhere. Personal protective equipment is only required for circumstances where personnel might be exposed to hazardous material. BSL-1 laboratories must have a door which can be locked to limit access to the lab, however it is not necessary for BSL-1 labs to be isolated from the general building. This level of biosafety is appropriate for work with several kinds of microorganisms including non-pathogenic Escherichia coli, Bacillus subtilis, Saccharomyces cerevisiae and other organisms not suspected to contribute to human disease. Due to the relative ease and safety of maintaining a BSL-1 laboratory, these are the types of laboratories generally used as teaching spaces for high schools and colleges. Laboratory personnel have specific training in handling pathogenic agents and are directed by scientists with advanced training. Access to the laboratory is limited when work is being conducted. Certain procedures in which infectious aerosols or splashes may be created are conducted in biological safety cabinets or other physical containment equipment. Biosafety level 2 is suitable for work involving agents of moderate potential hazard to personnel and the environment. This includes various microbes that cause mild disease to humans, or are difficult to contract via aerosol in a lab setting. Examples include Hepatitis A, B, and C viruses, human immunodeficiency virus (HIV), pathogenic Escherichia coli, Staphylococcus aureus, Salmonella, Plasmodium falciparum, and Toxoplasma gondii. Researcher at US Centers for Disease Control, Atlanta, Georgia, working with influenza virus under biosafety level 3 conditions, with respirator inside a biosafety cabinet (BSC). All laboratory personnel are provided medical surveillance and offered relevant immunizations (where available) to reduce the risk of an accidental or unnoticed infection. A laboratory-specific biosafety manual must be drafted which details how the laboratory will operate in compliance with all safety requirements. In addition, the facility which houses the BSL-3 laboratory must have certain features to ensure appropriate containment. The entrance to the laboratory must be separated from areas of the building with unrestricted traffic flow. Additionally, the laboratory must be behind two sets of self-closing doors (to reduce the risk of aerosols escaping). The construction of the laboratory is such that it can be easily cleaned. Carpets are not permitted, and any seams in the floors, walls, and ceilings are sealed to allow for easy cleaning and decontamination. Additionally, windows must be sealed, and a ventilation system installed which forces air to flow from the "clean" areas of the lab to the areas where infectious agents are handled. Air from the laboratory must be filtered before it can be recirculated. Biosafety level 3 is commonly used for research and diagnostic work involving various microbes which can be transmitted by aerosols and/or cause severe disease. These include Francisella tularensis, Mycobacterium tuberculosis, Chlamydia psittaci, Venezuelan equine encephalitis virus, Eastern equine encephalitis virus, SARS coronavirus, Coxiella burnetii, Rift Valley fever virus, Rickettsia rickettsii, several species of Brucella, chikungunya, yellow fever virus, and West Nile virus. 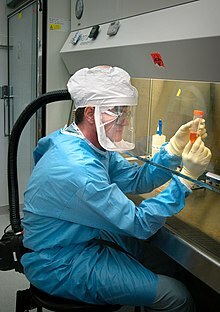 Biosafety level 4 (BSL-4) is the highest level of biosafety precautions, and is appropriate for work with agents that could easily be aerosol-transmitted within the laboratory and cause severe to fatal disease in humans for which there are no available vaccines or treatments. BSL-4 laboratories are generally set up to be either cabinet laboratories or protective-suit laboratories. In cabinet laboratories, all work must be done within a class III biosafety cabinet. Materials leaving the cabinet must be decontaminated by passing through an autoclave or a tank of disinfectant. The cabinets themselves are required to have seamless edges to allow for easy cleaning. Additionally the cabinet and all materials within must be free of sharp edges in order to reduce the risk of damage to the gloves. In a protective-suit laboratory, all work must be done in a class II biosafety cabinet by personnel wearing a positive pressure suit. In order to exit the BSL-4 laboratory, personnel must pass through a chemical shower for decontamination, then a room for removing the positive-pressure suit, followed by a personal shower. Entry into the BSL-4 laboratory is restricted to trained and authorized individuals, and all persons entering and exiting the laboratory must be recorded. As with BSL-3 laboratories, BSL-4 laboratories must be separated from areas that receive unrestricted traffic. Additionally airflow is tightly controlled to ensure that air always flows from "clean" areas of the lab to areas where work with infectious agents is being performed. The entrance to the BSL-4 lab must also employ airlocks to minimize the possibility that aerosols from the lab could be removed from the lab. All laboratory waste, including filtered air, water, and trash must also be decontaminated before it can leave the facility. Biosafety level 4 laboratories are used for diagnostic work and research on easily transmitted pathogens which can cause fatal disease. These include a number of viruses known to cause viral hemorrhagic fever such as Marburg virus, Ebola virus, Lassa virus, Crimean-Congo hemorrhagic fever. Other pathogens handled at BSL-4 include Hendra virus, Nipah virus, and some Flaviviruses. Additionally, poorly characterized pathogens which appear closely related to dangerous pathogens are often handled at this level until sufficient data are obtained either to confirm continued work at this level, or to permit working with them at a lower level. This level is also used for work with Variola virus, the causative agent of smallpox, though this work can only be done at the World Health Organization approved facilities at the Centers for Disease Control and Prevention in Atlanta, United States, as well as the State Research Center of Virology and Biotechnology in Koltsovo, Russia. SPECT machine at BSL-4 imaging facility that separates subjects with pathogens from the machines. The circular containment tube separates the patient table in the "hot" zone (pathogen present) from the "cold" zone around this MRI machine. Working inside a BSL-4 lab with air hoses providing positive air pressure. Sample-return missions that bring back to Earth samples obtained from a Category V body, must be curated at facilities rated BSL-4. 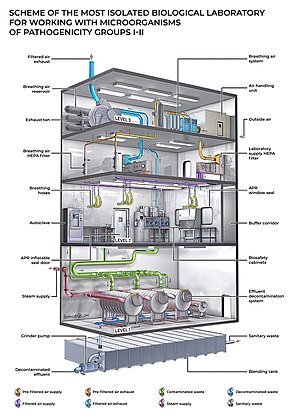 Because the existing BSL-4 facilities in the world do not have the complex requirements to ensure the preservation and protection of Earth and the sample simultaneously, there are currently at least two proposals to build a BSL-4 facility dedicated to curation of restricted (potentially biohazard) extraterrestrial materials. The first is the European Sample Curation Facility (ESCF), proposed to be built in Vienna, would curate non-restricted samples as well as BSL-4 biocontainment of restricted material obtained from Category V bodies such as Mars, Europa, Enceladus, etc. The other proposal is by NASA and is tentatively known as the Mars Sample-Return Receiving facility (MSRRF). At least three different designs were submitted in 2009. If funded, this American facility would be expected to take 7 to 10 years from design to completion, and an additional two years is recommended for the staff to become proficient and accustomed to the facilities. NASA is also assessing a 2017 proposal to build a mobile and modular BSL-4 facility to secure a sample return capsule at the landing site to conduct preliminary biohazard analyses. After completion of biohazard testing, decisions could be made to sterilize the sample or transport all or portions to a permanent quarantine storage facility anywhere in the world. The systems of such facilities must be able to contain unknown biohazards, as the sizes of any putative alien microorganisms or infectious agents are unknown. Ideally it should filter particles of 0.01 µm or larger, and release of a particle 0.05 µm or larger is unacceptable under any circumstance. According to the U.S. Government Accountability Office (GAO) report published on October 4, 2007, a total of 1,356 CDC/USDA registered BSL-3 facilities were identified throughout the United States. Approximately 36% of these laboratories are located in academia. 15 BSL-4 facilities were identified in the U.S. in 2007, including nine at federal labs. The following is a list of existing BSL-4 facilities worldwide. National Service of Healthcare and Agriculture Quality (SENASA) Buenos Aires, Argentina Diagnostic laboratory for Foot-and-mouth disease. Australian Animal Health Laboratory Geelong, Victoria, Australia 1985 Large diagnostic and research lab equipped with two BSL-4 animal rooms. University of Melbourne – Doherty Institute for Infection and Immunity Melbourne, Victoria, Australia 2014 Diagnostic reference lab. National High Security Laboratory Melbourne, Victoria, Australia Operates under the auspice of the Victoria Infectious Diseases Reference Laboratory. Laboratório Nacional Agropecuário de Minas Gerais (Lanagro/MG) Pedro Leopoldo, Minas Gerais, Brazil 2014 Focus on Agropecuary diseases and diagnostics. National Microbiology Laboratory Winnipeg, Manitoba, Canada Located at the Canadian Science Centre for Human and Animal Health, it is jointly operated by the Public Health Agency of Canada and the Canadian Food Inspection Agency. Wuhan Institute of Virology of the Chinese Academy of Sciences Wuhan, Hubei, China 2015 Wuhan Institute of Virology has existed since 1956 and already hosted BSL3 laboratories. A BSL4 facility was completed in 2015, and became the first BSL-4 laboratory in China. Jean Mérieux BSL-4 Laboratory Lyon, Metropolis of Lyon, France 1999 Built and owned by the Fondation Mérieux. Since 2004, operated by INSERM. Laboratoire de la DGA Vert-le-Petit, Essonne, France 2013 Operated by the Ministry of Defense. Centre International de Recherches Médicales de Franceville Franceville, Haut-Ogooué Province, Gabon This facility is operated by a research organization supported by both Gabonese (mainly) and French governments, and is West Africa's only P4 lab (BSL-4). Robert Koch Institute Berlin, Germany 2015 Diagnostic and experimental lab facility. Bernhard Nocht Institute for Tropical Medicine Hamburg, Germany Part of the Leibniz Center Infection. National reference lab for tropical viruses. Friedrich Loeffler Institute Isle of Riems, Greifswald, Mecklenburg-Vorpommern, Germany 2010 Focus on animal viral diseases and diagnostics. Philipps University of Marburg Marburg, Hesse, Germany 2008 Focuses on hemorrhagic fever viruses. Országos Epidemiológiai Központ – National Center for Epidemiology Budapest, Hungary 1998 Division of Virology operates three WHO National Reference Laboratories. The BSL-4 biosafety laboratory provides a modern means to process dangerous imported zoonotic viral pathogens. University of Pécs Pécs, Hungary 2016 Opened in 2016, part of "Szentágothai János Kutatóközpont". High Security Animal Disease Laboratory (HSADL) Bhopal, Madhya Pradesh, India 1998 This facility deals especially to zoonotic organisms and emerging infectious disease threats. Centre for Cellular and Molecular Biology Hyderabad, Telangana, India 2009 National BSL-4 Containment Facility for Human Infectious Diseases. Microbial Containment Complex Pune, Maharashtra, India 2012 Run by the National Institute of Virology. Istituto Nazionale per le Malattie Infettive Rome, Lazio, Italy 1997 The "National Institute of Infectious Diseases" used to operate within the Lazzaro Spallanzani hospital; the facility is now independent and is home to five BSL-3 labs as well as a single BSL-4 laboratory, which was completed in 1997. National Institute for Infectious Diseases Musashimurayama, Tokyo, Japan 2015 Located at National Institute for Infectious Diseases, Department of Virology I. Built in 1981; operated at BSL-3 until 2015 due to opposition from nearby residents. Institute of Physical and Chemical Research (RIKEN) Tsukuba, Ibaraki Prefecture, Japan 1984 Facility completed in 1984 but not operated as BSL-4 due to local opposition. State Research Center of Virology and Biotechnology (VECTOR) Koltsovo, Novosibirsk Oblast, Russia One of two WHO-approved facilities for work on variola virus. Public Health Agency of Sweden Solna, Stockholm County, Sweden 2001 The only BSL-4 facility in the Nordic region. Constructed for research and diagnostics of hemorrhagic fever viruses. University Hospital of Geneva Geneva, Canton of Geneva, Switzerland "Glove box" type laboratory; primarily for handling clinical samples. Spiez Laboratory Spiez, Canton of Bern, Switzerland 2013 Run by Federal Office for Civil Protection and the Federal Department of Defence, Civil Protection and Sports. Institute of Medical Virology Zurich, Canton of Zurich, Switzerland Part of the University of Zurich. Primary purpose is diagnostics of highly pathogenic viruses. Francis Crick Institute Camden, Greater London, United Kingdom 2015 Has BSL-4 space but does not work on human pathogens. Health Protection Agency's Centre for Infections Colindale, Greater London, United Kingdom Department of Health laboratory. Diagnostics for various viral diseases. Part of the European Network of Biosafety-Level-4 Laboratories. National Institute for Biological Standards and Control Potters Bar, Hertfordshire, United Kingdom Department of Health and Home Office laboratory. Develop assays and reagents for research on virulent pathogens. Veterinary Laboratories Agency Addlestone, Surrey, United Kingdom Department for Environment, Food and Rural Affairs laboratory. Diagnostics and research for animal diseases. Institute for Animal Health Pirbright, Surrey, United Kingdom Biotechnology and Biological Sciences Research Council laboratory. Research on highly pathogenic animal diseases. Merial Animal Health Pirbright, Surrey, United Kingdom Private lab. Produces vaccines against foot and mouth disease and bluetongue disease. Centre for Emergency Preparedness and Response Porton Down, Wiltshire, United Kingdom Department of Health laboratory. Diagnostics and research for haemorrhagic fever viruses. Part of the European Network of Biosafety-Level-4 Laboratories. Defence Science and Technology Laboratory Porton Down, Wiltshire, United Kingdom Ministry of Defence laboratory. Focuses on protection from biological weapons. Centers for Disease Control and Prevention, Division of Vector Borne Diseases Fort Collins, Colorado, United States A BSL 3/4 facility that operates in connection with some of CSU's biomedical research programs. The Fort Collins, Colorado location specializes in arboviral and bacterial diseases. Centers for Disease Control and Prevention Atlanta, Georgia, United States Currently operates in two buildings. One of two facilities in the world that officially hold smallpox. Georgia State University Atlanta, Georgia, United States 1997 Research focus on B virus. National Bio and Agro-Defense Facility (NBAF), Kansas State University Manhattan, Kansas, United States 2022 (expected) Under construction. Facility to be operated by the Department of Homeland Security, and replace the Plum Island Animal Disease Center. Expected to be operational by 2022-2023. National Institutes of Health (NIH) Bethesda, Maryland, United States Located on the NIH Campus, it currently only operates with BSL-3 agents. Integrated Research Facility Fort Detrick, Maryland, United States Operated by NIAID. Focuses on animal models of human diseases. National Biodefense Analysis and Countermeasures Center Fort Detrick, Maryland, United States Operated by the Department of Homeland Security. Focus on potential bioterrorism threats. US Army Medical Research Institute of Infectious Diseases (USAMRIID) Fort Detrick, Maryland, United States 1969 Run by the U.S. Army. Research focuses on biological threats to the U.S. military. National Emerging Infectious Diseases Laboratory (NEIDL), Boston University Boston, Massachusetts, United States Built 2008, Opened 2012, BSL-4 Approval in 2017  Focus on potential threats to public health. Rocky Mountain Laboratories Hamilton, Montana, United States 1928 NIAID laboratory. Focus on vector-borne diseases. Galveston National Laboratory, National Biocontainment Facility Galveston, Texas, United States Opened in 2008, facility is operated by the University of Texas Medical Branch. Shope Laboratory Galveston, Texas, United States 2004 Operated by the University of Texas Medical Branch. Texas Biomedical Research Institute San Antonio, Texas, United States 1999 The only privately owned BSL-4 lab in the US. A North Carolina Mosquito & Vector Control Association (NCMVCA) study highlighted safety concerns. In the United States, laboratories can be funded by federal, state, private, non-profit, or academically. The last accounts for 72% of the funding. There is no central monitoring agency accountable for monitoring laboratories and standards vary according to funding, the age of the laboratory, and is dependent on the size and whether it is SA approved. High-containment labs that are registered with the Centers for Disease Control and Prevention (CDC) and the U.S. Department of Agriculture's (USDA) Select Agent Program must adhere to Department of Defense standards. No single federal agency, according to 12 agencies' responses to a GSA survey, has the mission to track the overall number of BSL-3 and BSL-4 labs in the United States. This means no agency is responsible for determining the risks associated with the proliferation of these labs. ^ a b "Integrated Research Facility". niaid.nih.gov. NIAID. Archived from the original on 28 November 2014. Retrieved 14 November 2014. ^ Richmond JY, McKinney RW, eds. (1999). Biosafety in Microbiological and Biomedical Laboratories (4th ed.). ISBN 0-7881-8513-6. Archived from the original on 2011-08-06. ^ Council Directive 90/679/EEC of 26 November 1990 on the protection of workers from risks related to exposure to biological agents at work, OJ No. L 374, p. 1. ^ Canada, Public Health Agency of. "Chapter 2: The Laboratory Biosafety Guidelines: 3rd Edition 2004 – Biological safety - Canada.ca". www.canada.ca. Archived from the original on 23 February 2018. Retrieved 7 May 2018. ^ Covt, Norman M. (1997), “A History of Fort Detrick, Maryland” Archived 2008-09-22 at the Wayback Machine, 3rd edition. Kaempf retired from Fort Detrick in 1994, having completed more than 50 years service. He was chief of the mechanical branch, Directorate of Engineering and Housing. ^ Manuel S. Barbeito; Richard H. Kruse. "A History of the American Biological Safety Association". American Biological Safety Association. Archived from the original on 2008-06-20. Retrieved 2008-08-14. ^ a b c "American Biological Safety Association Collection : NAL Collections : National Agricultural Library". United States Department of Agriculture: National Agricultural Library. 2009-02-11. Archived from the original on 2009-02-27. Retrieved 2009-02-11. ^ a b c d e f g h i j k l m n o p q r s t u v w x "Section IV-Laboratory Biosafety Level Criteria". Biosafety in Microbiological and Biomedical Laboratories, 5th ed (PDF). U.S. Department of Health and Human Services. December 2009. pp. 30–59. Archived (PDF) from the original on 9 April 2016. Retrieved 2 April 2016. ^ a b c d e Richmond JY. "The 1, 2, 3's of Biosafety Levels" (PDF). Archived (PDF) from the original on 19 March 2015. Retrieved 2 April 2016. ^ "Health & Safety Manual - Biological Safety". Columbia University Environmental Health and Safety. Archived from the original on 27 March 2016. Retrieved 2 April 2016. ^ a b "Section III-Principles of Biosafety". Biosafety in Microbiological and Biomedical Laboratories, 5th ed (PDF). U.S. Department of Health and Human Services. December 2009. pp. 22–28. Archived (PDF) from the original on 10 March 2016. Retrieved 9 April 2016. ^ a b c For a list of infectious agents and the recommended biosafety level at which they should be studied, see "Section VIII-Agent Summary Statements". Biosafety in Microbiological and Biomedical Laboratories, 5th ed (PDF). U.S. Department of Health and Human Services. December 2009. pp. 123–289. Archived (PDF) from the original on 27 March 2016. Retrieved 9 April 2016. ^ a b c "Section VIII-Agent Summary Statements". Biosafety in Microbiological and Biomedical Laboratories, 5th ed (PDF). U.S. Department of Health and Human Services. December 2009. p. 219. Archived (PDF) from the original on 13 May 2016. Retrieved 4 May 2016. ^ Seligson, Susan (7 March 2013). "Video Offers Glimpse of Biosafety Level 4 Lab Science webcast "threads the NEIDL"". BU Today. Archived from the original on 10 December 2014. Retrieved 5 December 2014. ^ a b How to Protect Mars Samples on Earth. Jeremy Hsu, Space.com. 3 December 2009. ^ a b EURO EURO-CARES Extraterrestrial Sample Curation Facility: Architecture as an enabler of science. (PDF) Aurore Hutzler, Emre Kilic, Allan Bennett, Ludovic Ferrière. 47th International Conference on Environmental Systems, 16-20 July 2017, Charleston, South Carolina. Document ICES-2017-323. ^ EURO-CARES. European Curation of Astromaterials Returned from Exploration of Space. Accessed: 25 September 2018. ^ Ronald Atlas (2002). "Mars Sample Return Receiving Facility" (PDF). NASA. ^ a b "7: "Sample-Receiving Facility and Program Oversight"". Assessment of Planetary Protection Requirements for Mars Sample Return Missions (Report). National Research Council. 2009. p. 59. ^ a b Mobile/Modular BSL-4 Facilities for Meeting Restricted Earth Return Containment Requirements. M. J. Calaway, F. M. McCubbin, J. H. Allton, R. A. Zeigler, and L. F. Pace. (PDF) NASA. 2017. ^ a b "High-Containment Biosafety Laboratories: Preliminary Observations on the Oversight of the Proliferation of BSL-3 and BSL-4 Laboratories in the United States" (pdf). United States Government Accountability Office. Oct 4, 2007. Archived (PDF) from the original on 12 February 2016. Retrieved 26 May 2016. ^ "Risk Analysis:Risk of Importing Foot-and-Mouth Disease in Susceptible Species and Products from a region of Patagonia, Argentina" (PDF). U.S. Department of Agriculture, National Import Export Services, Veterinary Services. January 2014. pp. 60–62. Archived (PDF) from the original on 21 October 2016. Retrieved 3 April 2016. ^ a b Racaniello V (14 July 2014). "Visiting biosafety level-4 laboratories". Virology Blog. Archived from the original on 18 April 2016. Retrieved 3 April 2016. ^ Committee on Anticipating Biosecurity Challenges of the Global Expansion of High-Containment Biological Laboratories (15 December 2011). "8: Requirements for and Challenges Associated with BSL-4 Labs (Plenary Session)". Biosecurity Challenges of the Global Expansion of High-Containment Biological Laboratories. National Academies Press (US). ISBN 9780309225755. Archived from the original on 7 May 2018. Retrieved 3 April 2016. ^ "Members: The Doherty Institute for Infection and Immunity". Global Virus Network. Archived from the original on 20 March 2016. Retrieved 3 April 2016. ^ "Laboratories: High Security/Quarantine". Victorian Infectious Diseases Reference Laboratory. Archived from the original on 19 April 2016. Retrieved 8 April 2016. ^ "Lanagro/MG é o primeiro do Brasil com nível de biossegurança máximo". MAPA - Ministério da Agricultura, Pecuária e Abastecimento. August 2014. Archived from the original on 23 February 2018. Retrieved 22 February 2018. ^ "National Microbiology Laboratory (NML) Overview". Public Health Agency of Canada. Archived from the original on 21 March 2016. Retrieved 8 April 2016. ^ "China Inaugurates the First Biocontainment Level 4 Laboratory in Wuhan". Wuhan Institute of Virology, Chinese Academy of Sciences. 3 February 2015. Archived from the original on 3 March 2016. Retrieved 9 April 2016. ^ "Biological Defence Department at Techonin". Ministry of Defense & Armed Forces of the Czech Republic. Archived from the original on 26 April 2016. Retrieved 9 April 2016. ^ "Jean Mérieux BSL-4 Laboratory". Fondation Mérieux. Archived from the original on 6 May 2016. Retrieved 11 April 2016. ^ "Inauguration du laboratoire biologique P4 de la DGA" (in French). Ministére de la Défense. Archived from the original on 8 May 2016. Retrieved 11 April 2016. ^ "Centre International de Recherches Medicales de Franceville" (in French). CIRMF. Archived from the original on 15 October 2014. Retrieved 30 September 2014. ^ "Das Hochsicherheitslabor im Robert Koch-Institut". Robert Koch Institut. Archived from the original on 19 May 2016. Retrieved 16 April 2016. ^ "Bernhard Nocht Institute for Tropical Medicine (BNI)". Heinrich Pette Institute. Archived from the original on 27 April 2016. Retrieved 16 April 2016. ^ "Friedrich Loeffler Institute, Germany". Caverion. Archived from the original on 22 April 2016. Retrieved 16 April 2016. ^ "Philipps-University Marburg". Philipps-University Marburg. Archived from the original on 11 June 2016. Retrieved 16 April 2016. ^ "Division of Virology". Országos Epidemiológiai Központ. Archived from the original on 24 September 2013. Retrieved 16 April 2016. ^ "Bio-containment Laboratory". National Institute of High Security Animal Diseases, India. Archived from the original on 19 March 2016. Retrieved 20 April 2016. ^ "Stone laid for stem cell research lab in Hyderabad". The Hindu. Archived from the original on 16 January 2016. Retrieved 25 April 2016. ^ "NIV Prune lab gets BSL-4". The Hindu. Archived from the original on 16 August 2017. Retrieved 24 April 2016. ^ "Storia dell'Istituto" (in Italian). IRCCS Lazzaro Spallanzani. Archived from the original on 7 March 2014. Retrieved 1 May 2016. ^ "Deadly disease lab opens amid local fears". Japan Times. 15 October 2015. Archived from the original on 28 April 2016. Retrieved 1 May 2016. ^ "Bio lab handling highly dangerous agents to open in suburban Tokyo". Japan Bullet. 3 August 2015. Archived from the original on 15 March 2018. Retrieved 14 March 2018. ^ "South Africa National Institute for Communicable Diseases". African National Public Health Institutes. Archived from the original on 18 March 2016. Retrieved 4 May 2016. ^ "P4-laboratoriet vid Folkhälsomyndigheten" (in Swedish). Public Health Agency of Sweden. Archived from the original on 15 October 2014. Retrieved 8 October 2014. ^ Cherpillod, P. "Management of suspect viral hemorrhagic fever patient in Geneva". Schweizerische Union fur Labormedizin. Archived from the original on 16 August 2016. Retrieved 10 May 2016. ^ a b "Convention on the Prohibition of the Development, Production and Stockpiling of Bacteriological (Biological) and Toxin Weapons and on their Destruction" (PDF). Switzerland Federal Department of Defence, Civil Protection, and Sports. 2016. Archived (PDF) from the original on 3 June 2016. Retrieved 10 May 2016. ^ "Case of SARS reported in a laboratory research worker in Taiwan". Eurosurveillance. 18 December 2003. Archived from the original on 11 June 2016. Retrieved 18 May 2016. ^ Ewen Callaway (6 June 2013). "London biomedical hub sets its research agenda". Nature. Archived from the original on 7 June 2016. Retrieved 26 May 2016. ^ a b c d e f g h Davison N; Lentzos F (2012). "E8: High-Containment Laboratories-UK Case Study". Biosecurity Challenges of the Global Expansion of High-Containment Biological Laboratories. pp. 176–177. ISBN 978-0-309-22575-5. Archived from the original on 23 June 2016. Retrieved 26 May 2016. ^ a b Nisii, Carla; Castilletti, Concetta; Raoul, Hervé; Hewson, Roger; Brown, David; Gopal, Robin; Eickmann, Markus; Gunther, Stephan; Mirazimi, Ali; Koivula, Tuija; Feldmann, Heinz; Di Caro, Antonino; Capobianchi, Maria R.; Ippolito, Giuseppe (2013). "Biosafety Level-4 Laboratories in Europe: Opportunities for Public Health, Diagnostics, and Research". PLoS Pathogens. 9 (1): e1003105. doi:10.1371/journal.ppat.1003105. PMC 3547859. PMID 23349630. ^ "About DVBD - Division of Vector-Borne Diseases (DVBD) - NCEZID - CDC". www.cdc.gov. 17 April 2018. Archived from the original on 16 December 2017. Retrieved 7 May 2018. ^ "Operating a BSL-4 Laboratory in a University Setting". Tradeline. 16 December 2003. Archived from the original on 30 June 2016. Retrieved 28 May 2016. ^ "Leveraging the National Bio and Agro-defense Facility". Kansas State University. Archived from the original on 10 June 2016. Retrieved 28 May 2016. ^ "An Integrated Research Facility: Questions and Answers". National Institute of Allergy and Infectious Diseases. Archived from the original on 22 June 2016. Retrieved 28 May 2016. ^ "Integrated Research Facility Overview". National Institute of Allergy and Infectious Disease. Archived from the original on 5 July 2016. Retrieved 28 May 2016. ^ "National Biodefense Analysis and Countermeasures Center". Department of Homeland Security. Archived from the original on 20 May 2016. Retrieved 28 May 2016. ^ "USAMRIID: Biodefense Solutions to Protect our Nation". U.S. Army Medical Department. Archived from the original on 5 June 2016. Retrieved 28 May 2016. ^ "USAMRIID Biological Safety". U.S. Army Medical Department. Archived from the original on 18 May 2016. Retrieved 28 May 2016. ^ "NEIDL Goes Public: BU Biosafety Labs Offer Tours to Press, Politicians". Retrieved 30 December 2018. ^ "NEIDL BSL-4 Lab Gets Green Light". Retrieved 30 December 2018. ^ "National Emerging Infectious Diseases Laboratories: About - Mission and Safety". Boston University. Archived from the original on 4 June 2016. Retrieved 28 May 2016. ^ "Rocky Mountain Labs Overview". National Institute for Allergy and Infectious Disease. Archived from the original on 29 April 2016. Retrieved 28 May 2016. ^ "Galveston National Laboratory Fact Sheet". Archived from the original on 5 October 2014. Retrieved 30 September 2014. ^ "Center for Biodefense and Emerging Infectious Diseases: Safety and Biocontainment". UTMB Health. Archived from the original on 5 January 2016. Retrieved 28 May 2016. ^ "About Texas Biomed: Biosafety Level 4 Laboratory". Texas Biomedical Research Institute. Archived from the original on 3 April 2016. Retrieved 3 April 2016. This page was last edited on 11 February 2019, at 14:49 (UTC).